Reason I choose it: I can't remember why I choose this one but its usually to do with the good reviews. Jazzy has the ability to have premonitions into the future. One day she has such a niggling feeling that she has to be in a certain place that in the end she gives in and ends up at a counselling group for people who have lost a family member. Once she finally arrives she meets Marnie and Rita. Marnie was in a relationship with a man who had a son from his previous relationship and she ends up raising him like her own son. It isn't until Troys dad dies does his mum come and take him away that Marnie feels the true loss in life. Rita is in her 50s and her daughter she believes was murdered 10 years earlier. The killer is still on the loose but no one knows where he is. On leaving the counselling group Marnies car won't start and Jazzy comes to the rescue, she phones her brother who comes to save the day by coming to collect them. Marnie invites Jazzy later on in the week for a meal at her house as a Thank You and its that day that we meet her landlady Laverne. Laverne has hardly left the house since her husband died and can't understand how things got to be how they are. The adventure begins when Marnie decides she wants to see Troy but is afraid to fly. Jazzy and Rita decide to join her as moral support and at the very last minute Jazzy invites Laverne much to every ones annoyance but in the end just accept it and the 4 women travel across the U.S to meet Troy. 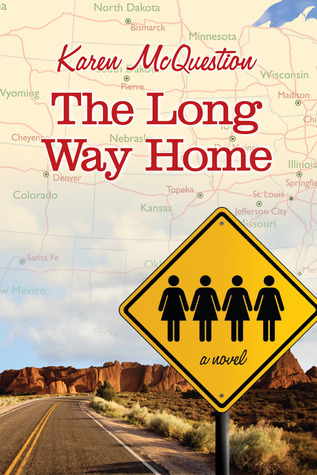 I have mixed opinions about this book as I think its a good book for a quick and simple read with nice story lines of the ladies adventures along the way but I feel the story lines dragged alot of the time as they make their way across the country. I also felt that I couldn't really warm to any of the characters as they weren't really portrayed in a nice or interesting way but a little flat.